Our volunteers helped over 300 cats and kittens last year and fund raised at 20 events. The volunteers are running at full stretch and to enable us to help more homeless cats/kittens, we need to move to the next level. 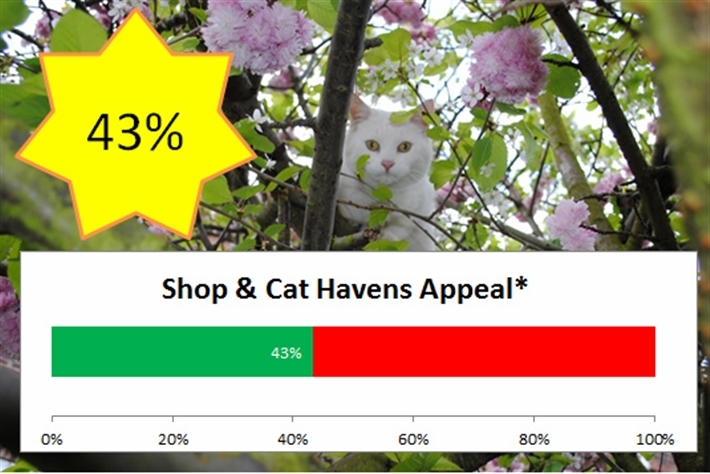 We are pleased to announce that all our volunteers are committed to our new project – Shop & Cat Havens Appeal - We need your support to succeed. To enable us to raise more funds we are looking to open a Shop in Crawley. This shop will enable us to raise the additional funds to help more cats/kittens, be an information centre and a point of advertising for new cat homes. The additional fund raising, will be used to support the new Shelters, this will give your local branch the needed additional cat foster spaces – allowing your local Cats Protection Branch to help more homeless felines – we will be able to supply the veterinary treatment, food, litter and heating these cats will need. Our volunteers will happily supply the care, attention and love.We struggle on a daily basis to find space in care for the many cats who need help and constantly run a waiting list – please support us and help us help more needy felines.Please think about giving a donation. *'Cat Haven' is defined as a building serving as a temporary refuge or residence for homeless and abandoned cats/kittens. The funds raised for the cat Havens (i.e. individual pens, will either be in one location or many different locations). If insufficient funds are raised to fulfil the main purpose, or if surplus funds are raised, these funds will be allocated directly on veterinary care for cats and kittens, cat/kitten food, litter and fostering equipment.